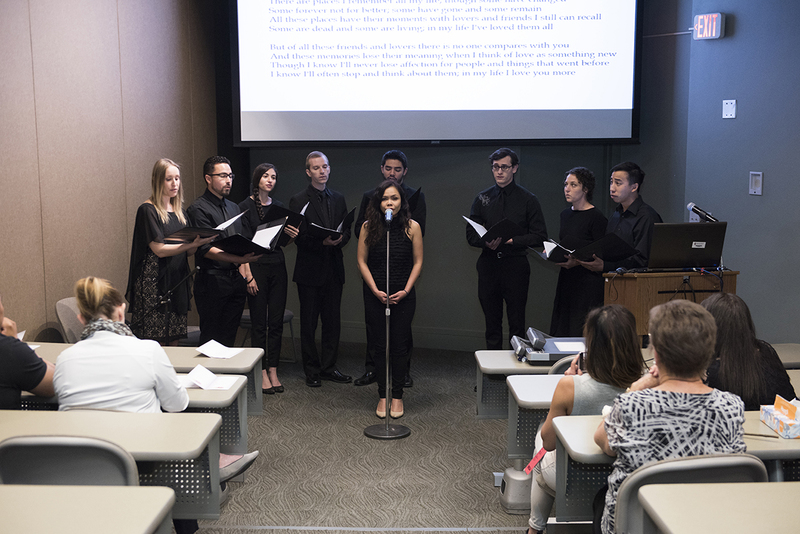 On Friday, May 11, medical students at Texas Tech University Health Sciences Center El Paso honored the individuals who helped make their education possible through the university’s Willed Body Program. The program allows individuals to gift their bodies to medical education after they pass, giving medical students valuable hands-on anatomy education. On May 11, students in Texas Tech University Health Sciences Center El Paso’s Paul L. Foster School of Medicine hosted a memorial service for those who made their education possible through the Willed Body Program. The program allows individuals to gift their bodies to medical education when they pass. The Willed Body Memorial is sponsored by the Gold Humanism Honor Society, an organization that recognizes students, residents and faculty who exemplify humanism in medicine—a major point of emphasis in the Paul L. Foster School of Medicine curriculum. In their first year of medical school, students are paired with the remains of a donor—who they refer to as their first patient—for lessons in clinical human anatomy. When they meet their patients, the students are given the donor’s first name and cause of death. As the students progress through their anatomy lessons, they learn more about their patient’s medical history through dissection. After one to two years of service to the program, the donor’s remains are cremated and either returned to the next of kin or buried in a local cemetery. In remembrance of their gift, the service included student orations, artwork and musical performances. Often, the Willed Body Memorial is the only service for the family of a loved one who has chosen to donate their body—donor bodies must be preserved immediately after death, limiting time for a memorial service. Before becoming a freestanding university in 2013, TTUHSC El Paso received its donor bodies from Texas Tech University Health Sciences Center (TTUHSC) in Lubbock, Texas. TTUHSC El Paso began supporting its own Willed Body Program in 2014. To date, the program has received 130 donations, and more than 450 individuals have pledged to donate their bodies to the program when they pass.